Per gallon. Two coats of SB-9000 are recommended. Allow first coat to dry to the touch before applying second coat. Second coat coverage is estimated between 350-400 sq. ft. per gallon (32.5-37.2 M/G). Actual coverage may vary depending on the type, age, condition, joint size and porosity of the surface, application method and site conditions such as temperature. TEST FIRST on a small inconspicuous area to determine the suitability and if desired results are achievable with this product on your specific surface. 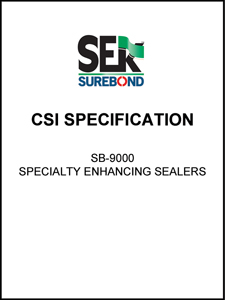 The surface should be thoroughly clean and free from oil, dust, dirt, loose material, and previously applied sealer other than SB-9000 prior to sealer application. If needed, prepare surface with Surebond Cleaners before sealing. Thoroughly rinse all cleaner residue prior to sealing. Allow surface to dry for a minimum of 24 hours after cleaning and/or rain before sealer application. Use a leaf blower to remove dust, debris and fine sand particles from the surface before sealing. 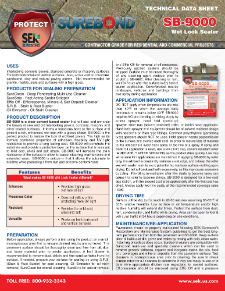 Cover/protect nearby landscape, vehicles and buildings from overspray during application. Apply when day and night temperatures are between 40°F – 95°F. Avoid windy conditions to keep sealer spray from drifting. NO pre-blending or mixing required. Do NOT dilute. Apply by airless sprayer, hand held (pump-up) sprayer, or short nap (solvent resistant) roller. Sprayer/equipment should be of solvent resistant design with neoprene or Viton type fittings. Hold sprayer nozzle perpendicular to the surface and overlap each coat. If spray and back-roll application is used, use a short (1/4”) nap, solvent resistant roller IMMEDIATELY AFTER SPRAYING as the product dries quickly. Short nap will ensure even application. If applying by roller only, it is advised to constantly maintain a wet edge, and to keep the roller wet with sealer resin to avoid potential lap marks or surface mottling upon drying. Do not roll back and forth excessively, as this may cause excessive bubbling. Re-rolling immediately after film starts to become tacky can cause the roller to become stringy. 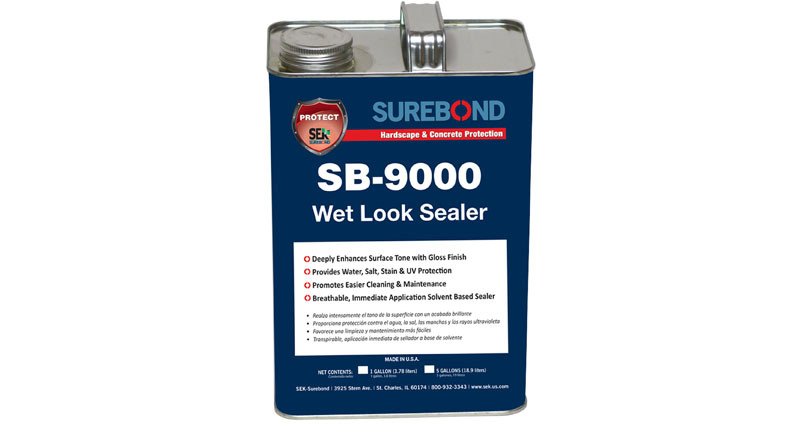 SB-9000 is designed for a two-coat application with the second coat to be applied only after the first coat has dried to the touch. NOTE: Excessive applications can cause surface to become slippery. Application of this product is out of the control of SEK-Surebond. Application steps should be followed completely and accurately. Should a problem occur with this product, SEK-Surebond limits liability to product replacement only. Buyer assumes all risk and liability resulting from the use or misuse of this product. Surface will be dry to the touch in 20-30 minutes assuming 65-85°F. Low surface or air temperature will extend dry times. Protect the surface from dust, rain, condensation, and traffic while drying. If dry, area can be open to foot & vehicular traffic in 24 hours depending on site conditions. 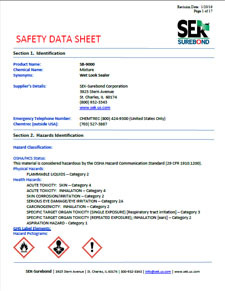 For tools and equipment use xylene or toluene.